Welcome to Cahoots Catering Co. Welcome and thank you for visiting our web site. 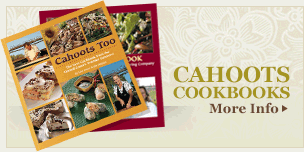 For those of you who are familiar with Cahoots Catering Co., we want to acknowledge your tremendous support over the past twenty one years, and look forward to many more. For those of you just getting to know us, welcome and come join the fun. Some of the current features on our site are catering menus, photo gallery, online purchasing of our products, recipes, a listing of upcoming special events and for those of you who sign up, a quarterly newsletter with many interesting topics. As Cahoots approaches its 22nd year in business our recipe for success remains the same; quality, consistency, dedication, hard work and an amazing staff. Cahoots Catering was ranked number one on the Tribunes’ list of “Top Catering Companies” in 2006 and 2007 averaging 700 to 750 events a year. "Versatility plays a big part in our day to day operation. The need for us to be all things to all people is important to us, as everyone’s need and desires are different. We look forward to catering to your needs."